Wild birds are counted for a wide variety of reasons and by a bewildering array of methods. 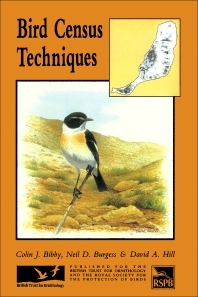 However, detailed descriptions of the techniques used and the rationale adopted are scattered in the literature, and the newcomer to bird census work or the experienced bird counter in search of a wider view, may well have difficulty in coming to grips with the subject as a whole. While not an end in itself, numerical and distributional census work is a fundamental part of many scientific and conservation studies, and one in which the application of given standards is vital if results are not to be distorted or applied in a misleading way. This book provides a concise guide to the various census techniques and to the opportunities and pitfalls which each entails. The common methods are described in detail, and illustrated through an abundance of diagrams showing examples of actual and theoretical census studies. Anyone with a bird census job to plan should be able to select the method best suited to the study at hand, and to apply it to best effect within the limits inherent in it and the constraints of the particular study. The Royal Society for the Protection of Birds and the British Trust for Ornithology have for many years pioneered the collaboration of amateurs and professionals in various census studies. Three members of their staff, each with extensive field experience, now pool the knowledge of these investigations to lay the groundwork for sound census work in future years. Purpose and Design in Counting Birds. Census Errors. Territory Mapping Methods Line Transects. Point Contacts. Catching and Marking. Counting Individual Species. Counting Colonial Flocking and Nesting Birds. Distribution Studies. Description and Measurement of Bird Habitat Chapter Summaries and Points to Consider. Index. Colin Bibby is Director of Science and Policy at the International Council for Bird Preservation where he is interested in the role of birds as indicators for global biodiversity conservation. While Head of Conservation Science at the Royal Society for the Protection of birds, he was a co-author of Red Data Birds in Britain. In both capacities, he has been struck by the small number of birds of conservation concern which have been counted adequately. He has counted birds in Britain and Europe, as a professional, as an amateur participant, and as an organizer of surveys for the British Trust for Ornithology. He was motivated to start this book by the belief that bird-watchers would contribute more to conservation if they put more effort into counting birds, but lack of guidance on methods was a handicap. Neil Burgess completed a B.Sc. in Botany and a Ph.D. in Palaeobotany (evolution of the earliest land plants), after which he started work at the Royal Society for the Protection of Birds. He worked on reserves and in the headquarters in Sandy on the management of habitats for birds. During this time the main work on the first edition of Bird Census Techniques was completed. In 1990 he became more involved with African conservation and biodiversity research through project management in the Africa Section of the International Department of the RSPB, and as Research Director of the Society for Environmental Exploration. Most of his work concentrated on tropical forest and wetland habitats in Africa and Southeast Asia, including ornithological surveys. He moved to the Danish Center for Tropical Biodiversity at the University of Copenhagen in 1994 to coordinate and develop programs aiming to map the distribution of biodiversity in Africa. He also worked as International Project Development Officer for the Danish Ornithological Society in 1995-1998. He has maintained an interest in ornithological survey work in Europe, but has moved increasingly into project management work in the tropics and Eastern Europe mainly through setting up and managing programs to assess biodiversity values and to undertake practical conservation actions. Royal Society for the Protection of Birds, The Lodge, Sandy, Bedfordshire, U.K.
David Hill is Chief Executive of Ecoscope Applied Ecologists which was established in 1992 to provide research and consulting services in ecology to both the public and private sectors in the UK and overseas. Much of Ecoscope's work involves the use of quality survey methods, many based on those described in this book. These methods are becoming increasingly important as standards for environmental assessment and he is actively involved in developing and setting practice standards for survey and evaluation within the profession. David Hill received his doctorate in bird ecology from the Edward Grey Institute of Field Ornithology at the University of Oxford in 1982 after which he moved to the Game Conservancy and later, as Senior Ecologist, to the RSPB. Much of this work involved studies of marked birds, their behavior and habitat preferences in relation to land use. In addition, he set up experiments and monitoring studies on RSPB reserves which brought him into close contact with sampling different bird species and habitats. In 1989 he became Director of Development at the British Trust for Ornithology with responsibility for setting up and running research contracts on estuaries, farmland, woodland and uplands using the methods outlined in this book. He has published a number of books and numerous papers on bird population ecology, habitat ecology and conservation, ecological assessment and mitigation. What started as a passion at the age of five has provided a rewarding career. He hopes this book, in giving to others tools to count birds, will engage enthusiasm and provide a similar reward to many, whilst at the same time yielding essential information for conservation. British Trust for Ornithology, Nunnery Place, Thetford, Norfolk, U.K.